I grew up hearing stories about the house with the swimming pool that my mom grew up in during the ’60s, and about the many times her family members had to fish out her little brother, who loved to ride his tricycle straight into the pool. There were no covers or nets or fences available back then, but nowadays, there’s a wide variety of products designed to keep kids safe from drowning accidents. 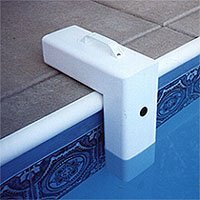 To help you enjoy your summer pool time, we’ve got a top pick plus a runner-up for each type of pool safety barrier that you can install around or on your pool to prevent accidental falls (or rides) into the water. Know what kinds of products you are looking for? Jump ahead to see our recommendations. Adding a fence around a pool is a common way to keep unsupervised children away from water, and it’s an excellent year-round solution that doesn’t require removal to use the pool. However, fences also add a significant visual element, so keep in mind that adding a fence will dramatically change the look of your property. If you decide to go with a fence, you have plenty of options to choose from. You can put up a permanent fence of any material (wood, metal, vinyl, etc. ), but that can get very expensive very quickly. We recommend a less expensive removeable pool fence, which you can easily take down if you have an adult-only gathering, for example. Fence installation involves drilling holes into the cement around the pool, but most companies include hole stoppers for when the fencing is removed. Fences are usually required to be four feet or five feet high, depending on where you live, so be sure to check the requirements for your location. While removable fences are less expensive than permanent ones, you can expect to pay around $15 to $20 per foot of fence plus installation fees and the cost of the gate. For a 100-foot fence, you could easily spend $2,000 or more. 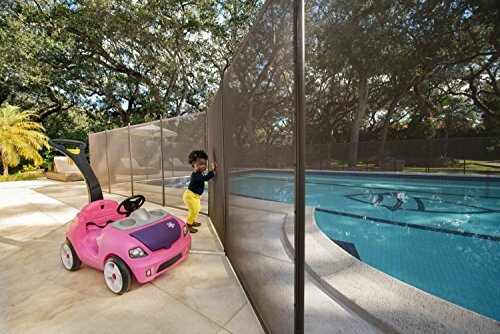 Our top pick for removable pool fences is the Protect-A-Child pool fence. The fence poles are made with a solid fiberglass core, which makes them stronger than aluminum-only poles. It also means they don’t heat up in the sun, won’t bend, and are non-conductive so they don’t require grounding. The poles are even protected with a lifetime warranty against breaking or bending. One safety feature that sets Protect-A-Child apart fences is that when the poles are inserted into their holes, they twist to lock in place. This makes it difficult for children or even unaware adults (such as babysitters) to remove the fencing. As an added safety measure, Protect-A-Child fences include caps to cover the holes in the cement when the fence is removed. The company also offers several fence color and height options, including five-foot-high fences. The mesh between poles is made of strong polyester, so your kids won’t be able to get through it. The mesh is also UV-resistant to prevent sun fading. The sections of fencing are connected by Protect-A-Child’s Point-Lock Secure Latches, which require two hands to latch or release, making it very difficult for children to get through. The gate is self-closing and self-latching with a magnetic latch, though adult supervision of the gate is always recommended. The only downside to Protect-A-Child (and many similar companies) is that you have to call a local dealer and set up an at-home evaluation in order to get any pricing information, and as mentioned above, removable fences aren’t cheap. However, you can be sure that your kids will be safe and that your fence will last a long time. Our runner-up option, the Life Saver Pool Fence, is very similar to the Protect-A-Child pool fence. In fact, Life Saver only falls short in that the poles don’t twist to lock into place, so it is slightly less secure that way. Other than that, both companies have several things in common: They both have a lifetime warranty on their products, and they both use similar components in their self-closing gates and latches that require two hands to release. They’re also both Campaign Safety Leaders for the Pool Safely Campaign. Like Protect-A-Child, Life Saver also lacks pricing information on its website, so you’ll need to contact a local dealer to get a quote. Life Saver offers a DIY kit through Amazon, and while that will save you some money on installation, you’ll have to acquire the correct drill and bit and remember that any mistakes or incorrect measurements may result in a less secure fence. That’s why we recommend professional installation whenever possible. The other difference between the two companies is that Life Saver uses a steel core in the poles and a polyvinyl mesh, but these differences don’t negatively affect the performance of the fence. The steel core makes the poles extremely difficult to bend, and the tightly woven mesh is UV-resistant and strong enough that children won’t be able to tear, climb, or wiggle under it. One perk with Life Saver is that for every fence it sells, the company donates a fence to a family who needs one but cannot afford it, so you can be sure your purchase is helping not only your family be safer but also another family. If you’d rather not drastically change the look of your pool, or if you are afraid your children will find a way past a fence, a safety cover that sits directly over the water is a great solution. Safety covers for pools serve two main purposes: to keep children or pets from accidentally falling into the pool and to cover your pool during the off-season. There are two types of covers—mesh and solid—which are installed using anchors in the concrete around the pool (which usually requires at least three feet of concrete on all sides). As long as it is properly installed, either type of cover should be strong enough for an adult to walk across in an emergency and too difficult for little children to remove. Mesh: The advantage of a mesh cover is that it allows rain and melted snow through so water won’t gather on top of the cover. Mesh covers are also lighter and easier to remove than solid ones. This also means that some dirt and dust will make it through the mesh, so you’ll need to clean your pool more in the spring. The other concern is that sunlight can get through the mesh and contribute to algae growth on the pool’s surface. For that reason, we recommend using a mesh cover with 98% shade. Solid: The advantage of a solid safety cover is that no light or debris will reach the water, so getting the pool ready in the spring will be faster. However, rain and snow will collect on the cover’s surface, and even small pools of standing water pose a potential risk to small children. Your options are to either get a pump to remove the water, which will cost extra and may last only a few years before needing to be replaced, or to get a solid cover with one or two mesh sections in the middle that will allow the water to drain. This hybrid option is our top choice because it combines the advantages of the two different designs and greatly reduces the disadvantages. While mesh covers are slightly less expensive than solid ones, both are still pretty pricey. Most companies require you to call for a quote, but you can expect to spend anywhere from $500 to $1,500 for the safety cover plus installation costs. The LOOP-LOC Ultra-Loc III Safety Cover is our top choice because it has a hybrid solid and mesh design. The solid portion protects most of the pool water from dirt and sunlight, while the mesh drainage panels prevent water from collecting on top of the cover. You can also get the Ultra-Loc III as a solid cover with an automatic pump for a slightly higher cost. The Ultra-Loc III meets all ASTM safety standards and has been tested in UL laboratories, so it is certifiably safe to use. It’s also more lightweight than similar solid covers, and it uses a unique material that drains water more quickly. The Ultra-Loc III comes with a 15-year prorated warranty—meaning repairs and replacements are free for the first two years, and after that you pay a portion of the cost. 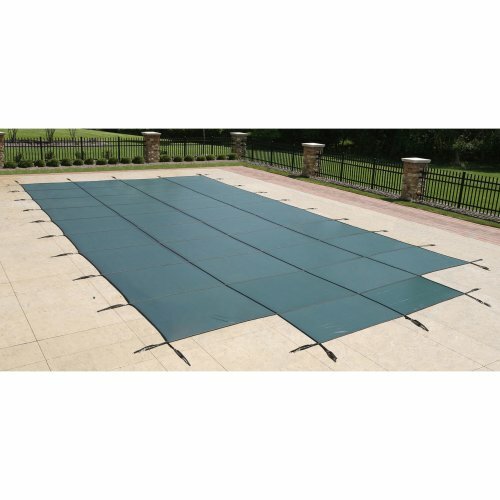 Overall, we consider the LOOP-LOC Ultra-Loc III one of the strongest and safest pool covers to protect your family and make the pool easier to clean in the spring. The GLI ProMesh Safety Cover has a mesh design, so it prevents puddles on top of the cover but keeps debris and leaves out of the pool. 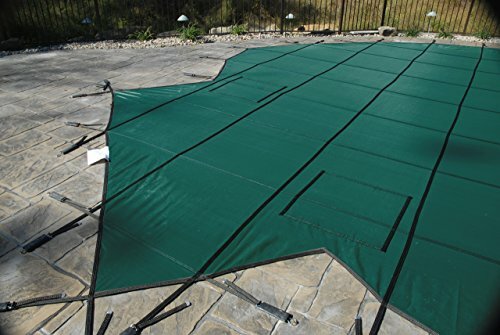 It is a tightly woven 98% shade mesh made with UV-resistant material, which reduces the amount of algae-promoting sunlight that hits the pool water. As with the Ultra-Lock III, the GLI ProMesh cover meets all ASTM standards, so you can be sure it’s safe to use. Mesh covers are generally lighter than solid covers, so the GLI ProMesh is easier to remove (especially if you remove the cover by yourself), and it can be customized to fit a pool of any size or shape. Since it’s a mesh cover, the ProMesh is less expensive than most solid covers by a few hundred dollars, but you’ll need to contact the company or a local dealer for a specific estimate. Overall, this is an all-around safe and easy-to-use cover for protecting your pool during the off-season months and keeping kids from falling in. If you can’t safely install a pool cover (perhaps you don’t have three feet of concrete on all sides of the pool) or your pool is open year-round, you might consider a pool safety net instead. 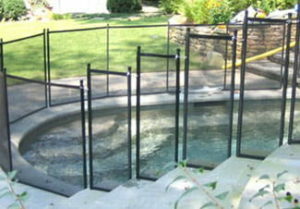 A safety net is installed around the edges of the pool like a safety cover, but it has three- to four-inch openings rather than solid construction. It is not designed to keep leaves and debris out of the pool, but only to prevent small children from falling in. In order to do this, most nets have a central tension system that pulls the net taut and can be released when you’re ready to remove the net. One advantage to nets is that they are very lightweight, making them easy to set up and take down—usually in less than 10 minutes. 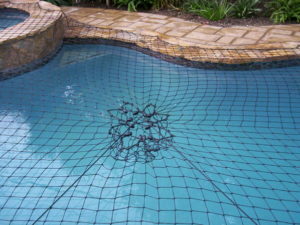 Nets are also less expensive than fences and covers and are more easily customized to fit oddly shaped pools. There are DIY net options, but you still have to drill anchors into the cement around the pool, so we recommend professional installation in spite of the additional cost. Most safety nets have the same features and meet the same safety standards, but a few things make the All-Safe Pool Safety Net our top pick. First, the All-Safe net’s square openings measure just 3.5 inches, which is slightly smaller than the openings in many other nets. Second, the net’s strands are 5mm wide, making it stronger and more durable than most safety nets, whose strands are 3.5mm or 4mm wide. And while this isn’t a safety issue, the third benefit is that All-Safe provides a tool to help remove and replace the net when the shape of the pool creates tension issues. These are all seemingly small details, but they add to the safety and convenience of the All-Safe pool net. Like most pool safety nets, the All-Safe has a central pulley system that tightens the net once all the anchors have been placed, and it can easily be rolled into a storage roller when it’s not being used. The All-Safe net is not cheap, but it does cost less than a fence or safety cover, making it a better option for those on a tighter budget. Like all our other recommendations, the All-Safe pool safety net meets all ASTM safety standards and is an all-around excellent choice for making your pool safe year-round. Our runner-up for pool safety nets comes from Katchakid. Like the All-Safe net, the Katchakid Swimming Pool Net meets all ASTM standards, so it is very safe to use. It’s also endorsed by the American Lifeguard Association. The net is made with UV-resistant, high-strength materials and is guaranteed to keep its shape with uniform openings across the entire net. It has a central pulley system for tightening the net, which is what keeps it off the water’s surface, even if a child were to fall on it. The pulley is easy to set or release, but because it requires a specific set of steps to do, kids won’t be able to release the net on their own. The safety net comes with a storage roller that prevents the net from tangling while it is not in use. Katchakid’s nets are competitively priced, but you have to schedule a free consultation in order to get a quote. However, it will likely be less expensive than covers and fences. 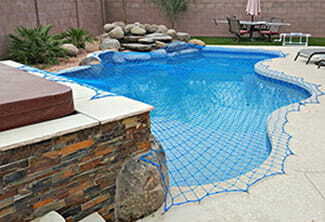 Overall, the Katchakid Swimming Pool Net is a great option for in-ground home swimming pools. Fences, covers, and nets are all great first lines of defense when it comes to protecting your children from pool dangers, However, it’s always a good idea to have a backup in place, just in case. Here are a few of our favorite pool accessories you can pair with any of the options above. A pool alarm detects motion in the water when someone or something falls into the pool. A good pool alarm shouldn’t be tricked by motion from wind, and it should have a loud alarm. The disadvantage to a pool alarm versus a gate alarm is that if a child falls into the pool and sets off the alarm, you have a very short amount of time to respond. However, if that happens, you’ll be alerted within 10 seconds and you know that it is an emergency and not a false alarm. 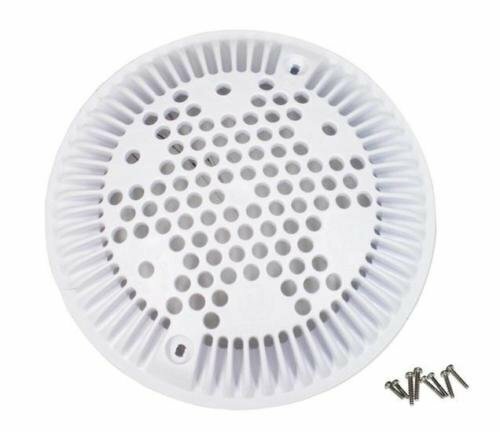 The Poolguard PGRM-2 In-ground Pool Alarm is always active and will sound an alarm when it is removed from the pool, so your kids can’t get around it. When you want to use the pool, you have to manually turn off alarm. A safety vacuum release system (SVRS) acts as part of the drainage system and monitors a pool’s suction. If the SVRS detects something blocking the drain, the suction is reversed or released. This means that if a child’s hair or swimming suit gets caught in the suction of a drain, the system will turn off and prevent the child from being trapped. As of 2008, all commercial pools are required to have anti-entrapment equipment installed,1 and we highly recommend it for home pools as well. 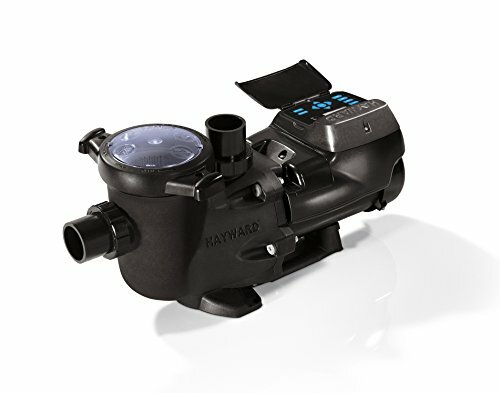 If you need to install a pump, make sure it’s one that has an SVRS, like the Hayward SP3400VSPVR SVRS Variable Speed Pool Pump. If you already have a pump, you can add an SVRS switch with an alarm (view on Amazon) that will automatically disable the pump and sound an alarm if blockage is detected, and it has to be manually reset afterwards. Part of maintaining a safe drainage system in your pool is making sure all of the drain covers are intact and up to date with current safety codes. The Hayward WGX1048E Cover meets ANSI and ASME standards, and because it is rounded, it is more difficult for things like hair to become trapped in the suction. 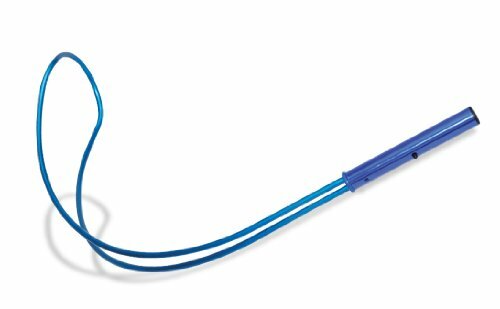 A rescue hook (also called a safety hook, life hook, reaching pole, or shepherd’s crook) can be used to pull someone to safety if they begin struggling in the pool. The Swimline 89900 Safety Hook for Pools is strong but lightweight, and it attaches to a pole with a spring-loaded button, though please note you’ll need to purchase a pole separately (like this one found here on Amazon). 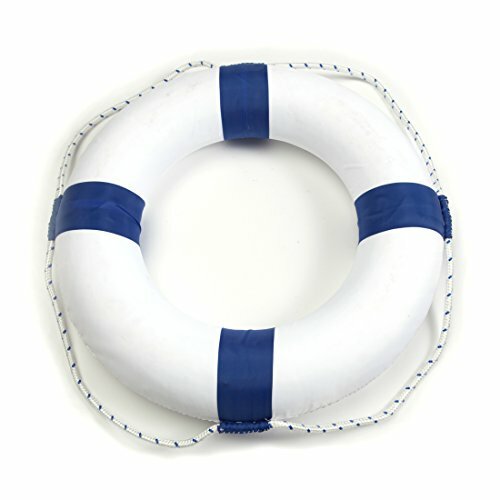 A life preserver ring is used to help someone who is struggling in the water get to dry land. You can attach a rope (like this one on Amazon) to the life preserver and throw it out to the person in the water, then pull them to safety. This Foam Ring Safety Life Preserver is made of lightweight foam so it will always float and has a rope securely attached to the sides so you can easily attach a longer rope. The most important rule when it comes to pool safety is that nothing can take the place of attentive adult supervision. All of the organizations that aim to prevent accidental drowning, including the National Drowning Prevention Alliance (NDPA) and the Pool Safely Campaign from the US Consumer Product Safety Commission (CPSC), emphasize that children should never be left unattended at a pool or other body of water—not even for a minute. We also highly recommend that you become certified in CPR and keep lifesaving tools—such as a first aid kit, rescue hook, and life preserver—near the pool and easily accessible. Safety organizations also emphasize the importance of teaching your children both how to swim and how to stay safe around water. Make sure that your drain covers are up to date and teach your kids how to avoid the drains in a pool. It’s also a good idea to use a barrier, such as a fence, cover, or net, and employ an alarm in or around the pool. Swimming and enjoying the summer should be positive experiences, so do everything necessary to make sure that is the case. Whether you choose to install a fence, a safety cover, or a net, we absolutely recommend using some kind of barrier to prevent children from accessing your home pool without your knowledge and permission. Even if your children know how to swim, accidents can happen unexpectedly, and being alert and aware of your children around the pool is the best way to prevent disasters. What do you use to keep your kids safe around your pool? Tell us in the comments below!